Exposure to domestic violence can have lasting effects on children and teens. Not all young people are affected in the same way, and in fact many children are resilient, able to heal and go on to thrive. 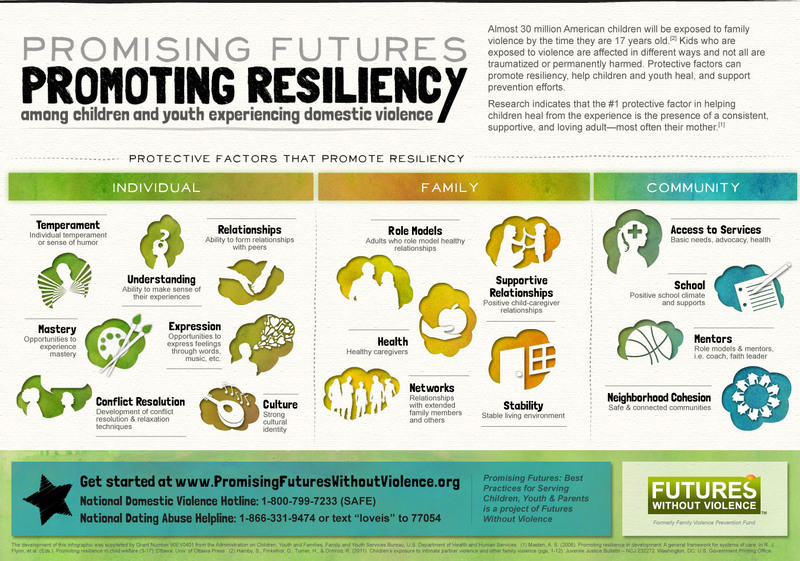 Various risk and protective factors among the child, family, and community can impact the ways in which children and teens process and understand the exposure to violence. Resilience has been defined as the maintenance of healthy ⁄ successful functioning or adaptation within the context of a significant adversity or threat.1 Five Protective Factors are the foundation of the Strengthening Families Approach: parental resilience, social connections, concrete support in times of need, knowledge of parenting and child development, and social and emotional competence of children. According to the Center for the Study of Social Policy, research shows that these protec­tive factors are also “promotive” factors that build family strengths and a family environment that promotes optimal child and youth development. The age of the child. The younger the child, the more harmful the impact may be. Young children are at high risk due to their immature ability to understand what is happening and why, or to regulate their own emotions. The child’s developmental stage. Like a child’s age, his/her developmental stage will also impact a child who is exposed to domestic violence, so different children within the same family will be affected differently. The exposure to domestic violence is likely to affect the tasks or milestones of the particular child’s stage of development. Severity, proximity, duration and frequency of the violence. Not surprisingly, a child exposed to extreme, on-going, and/or frequent violence is more likely to be traumatized or seriously harmed than a child who is exposed to lesser levels of violence (pushing, shoving) or violence that occurs rarely. Furthermore, exposure to multiple forms of violence (domestic violence, child abuse, community violence, and so on) places children at higher risk. The child’s gender. Boys and girls may be affected differently. Note that these are trends rather than uniform reactions — some children display reactions more common to the opposite gender. The child’s role in the family. A single child may play different roles over time (confidant, scapegoat, caretaker, abuser’s assistant, referee, perfect child) and have feelings of guilt or grief over the things they have done. Personal characteristics of the child (i.e. sense of self, mastery of tasks, sense of humor, security). Amazingly, there are children who seem to have a strong sense of self and are able to weather an enormous amount of violence in their lives by drawing on internal reserves and resources. These children seem to understand that the violence isn’t their fault, feel successful in various areas of their life (school, sports, friendships), and may have strong sense of racial or ethnic pride. High intelligence has also been associated with positive adaptation in the face of adversity. Presence or absence of loving and supportive adults in their lives. The single most critical factor in how children weather exposure to domestic violence is the presence of at least one loving and supportive adult in their life.3 Thus, children whose mothers are available and supportive will be better able to develop self-regulation abilities within the context of effective mother–child interactions4. Children without any support, who are isolated or lack nurturing adults in their lives, are more negatively affected by their exposure to DV. For many children the loving and supportive adult is most likely their mother, who did her best to provide her children a normal life even as she was being abused. Other adults can play this role as well, however — a grandmother, godparent, foster parent, coach, teacher, or neighbor can be the lifeline for a child coping with domestic violence. Stability and responsiveness of staff and systems that interact with the child. Knowledgeable and skilled dv advocates, child protection practitioners, teachers, coaches, mentors, police officers, judges, and others who understand and respond effectively to families in which domestic violence occurs can play a significant role in how children in those families are impacted. When we send a child appropriate and consistent messages in our actions and words that violence is a choice, that the violent adult is responsible for his own behavior, and that everyone in the family deserves to be safe, we are making a difference in how that child makes sense of the world and his or her family. Read more about how parents and caregivers can support children and youth heal. 1Garmezy, N. (1993). Risk and resilience. In D. C. Funder, R. D. Parke, C. Tomlinson-Keasey & K. Widaman (Eds. ), Studying lives through time: Personality and development (pp. 377–398). Washington, DC: American Psychological Association. Center on Domestic Violence/Pennsylvania Coalition Against Domestic Violence. Available at: http://www.vawnet.org. 3Osofsky, J. D. (1999). The impact of violence on children. The Future of Children: Domestic Violence and Children, 9 (3), 38. 4 Wyman, P. A., Cowen, E. L., Work, W. C., Hoyt-Meyers, L., Magnus, K. B., & Fagen, D. B. (1999). Caregiving and developmental factors differentiating young at-risk urban children showing resilient versus stress-affected outcomes: A replication and extension. Child Development, 70, 645–659.